The marijuana industry added 64,389 jobs in 2018, a 44 percent gain, according to industry experts Leafly and Whitney Economics. Economists believe the U.S. job market overall is getting tight, evidenced by the 20,000 growth in payrolls for February. Job creation is expected to grow as more states legalize pot. Nick Colas at DataTrek Research said cannabis is the "fastest-growing labor market in the U.S."
At a time when the rest of the labor market appears to be tightening up, the marijuana industry is just getting started when it comes to job creation, according to a recent report. Pot manufacturers and distributors, on both the recreational and medicinal sides, saw massive job creation in 2018, with 64,389 new positions added to the rolls. That brings to 211,000 the number of jobs directly related to the industry, part of a total of 296,000 in all related areas combined, industry site Leafly said in a report it compiled with Whitney Economics. The U.S. economy in total created about 2.7 million new jobs in 2018, according to the Bureau of Labor Statistics, which does not count cannabis-related hiring because the substance is still considered a Schedule 1 narcotic at the federal level. Hiring slowed to a crawl in February, with payrolls growing by just 20,000. That came even though the BLS said there were 7.3 million job openings against just 6.3 million considered unemployed in December, the most recent month for which data were available. "Amid the roiling debate over American jobs, the legal cannabis industry remains a substantial and unrecognized engine of grassroots job creation," the report's authors wrote. "In 2019, America's cannabis industry is one of the nation's greatest economic success stories. That success deserves to be recognized and celebrated." The document was written by Bruce Barcott, Leafly's deputy editor, and Whitney Economics founder Beau Whitney. Because there is no official count the report had to use some unconventional methods to estimate the jobs total. They utilized state data, industry surveys, information from operators, proprietary data and other economic formulas. What they found was stunning: a 44 percent gain in the workforce for 2018 that came on top of a 21 percent increase the previous year. At 211,000, the total number of jobs compares favorably to other more mainstream occupations: there were 131,430 chefs in the country, for instance, along with 65,760 aerospace engineers and 40,000 computer operators, according to the most recent BLS counts. "US marijuana legalization is a rare example of disruption creating jobs rather than destroying them," Nick Colas, co-founder of DataTrek Research, said in a note Thursday that highlighted some of the cannabis jobs data. "With the US labor market recently showing signs of weakness and fears of an eventual recession in the wings, this is one industry that might soften the blow of an economic downturn." Colas expects pot-related job creation to continue as more states legalize the substance. He called cannabis "the fastest-growing labor market in the U.S."
In recent days, New Jersey officials unveiled a plan that would legalize marijuana and set up a taxation structure. New York also has plans underway to add to the roster of 10 states that already have gone the legalization route. Sen. Cory Booker, a New Jersey Democrat and presidential candidate for the 2020 election, introduced a bill a few weeks ago that would legalize marijuana nationally. Along with the bottom-line gains, the industry's growth also offers an alternative to the push for young Americans to get a college degree, which has led to an explosion of student loan debt that now totals nearly $1.6 trillion. "Americans with a college degree are basically at full employment, but most Americans do not have those credentials and their participation rates are lower than the former," Colas wrote. "The marijuana industry offers solid paying positions at all levels of experience and educational attainment." Colas cited Glassdoor data showing that median pay in the cannabis industry is 11 percent above the median U.S. salary of $52,863. "Budtenders," the staff members who work directly with customers, generally earn $12 to $16 an hour, according to the site that allows current and former employees to review their workplaces and list typical salaries. At the other end of the spectrum, cultivation and extraction directors and outside sales representatives can earn well into six figures. As more states have moved to create a legal supply chain for marijuana, less cannabis is being smuggled over the U.S.'s southern border. That's the conclusion of a new analysis from the Cato Institute, which looked at Border Patrol marijuana seizures over time. Colorado and Washington became the first states to legalize cannabis in 2012, with legal sales starting in 2014, and more states have gotten on board each election cycle since. There are now ten states that have ended marijuana prohibition, with several more expected to do so in 2019 and 2020. "From FY 2003 to FY 2009, Border Patrol doubled its workforce and constructed hundreds of miles of fences, yet this increased enforcement did not reduce marijuana smuggling. Each agent annually seized virtually the same quantity of marijuana through 2013, indicating roughly the same overall inflow of the illegal substance." The findings bolster the claims of legalization advocates, who have argued for years that American consumers would much prefer to buy marijuana from licensed producers who test and label their products for potency and purity than via the illegal market, where no such quality control occurs. Rep. Matt Gaetz (R-FL) picked up on the idea in a congressional hearing last week, urging Homeland Security Sec. Kirstjen Nielsen to acknowledge that ending federal marijuana prohibition would make her and her agents' jobs easier. “Some think that state-based marijuana is a gateway drug and makes people want illicit products more," he said, "but the people who’ve looked at your agency—and you’ve got this very difficult job—are saying that if states have the ability to innovate and make legal, high-quality medical cannabis available to people, then we’re not going to have as difficult a job for you and your border patrol agents and for the people who live across our border." Americans who are planning to travel to the country in the near future should know that it won’t be a complete cannabis free-for-all – fewer than 200 retailers country-wide will be open for business on Day One. On the West Coast, British Columbia will have just one government-run marijuanastore, in the city of Kamloops, to start. 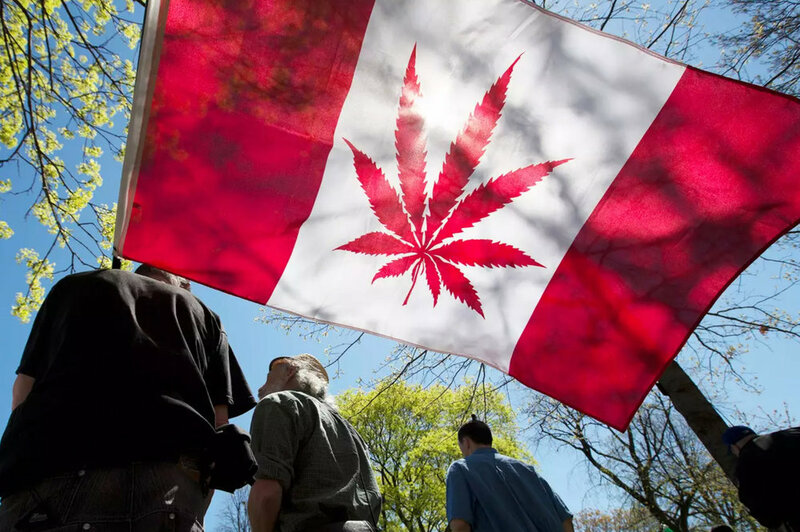 On the east coast, Montreal will have quite a few more options, with 12 marijuana shops set to open on Wednesday, and another three to follow by the end of the month. By the end of the year, there will be 20 cannabis stores up and running across Quebec, all of which will be monopolized by the government-run Société Québécoise du Cannabis (SQDC), an offshoot of the government’s liquor store monopoly. While Quebec has handed control over to the local government, other provinces are planning to spread the wealth and issuing licenses to private distributors.